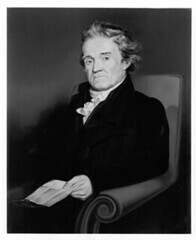 Noah Webster (1758-1843) was an American educator, lexicographer, textbook pioneer, and author. 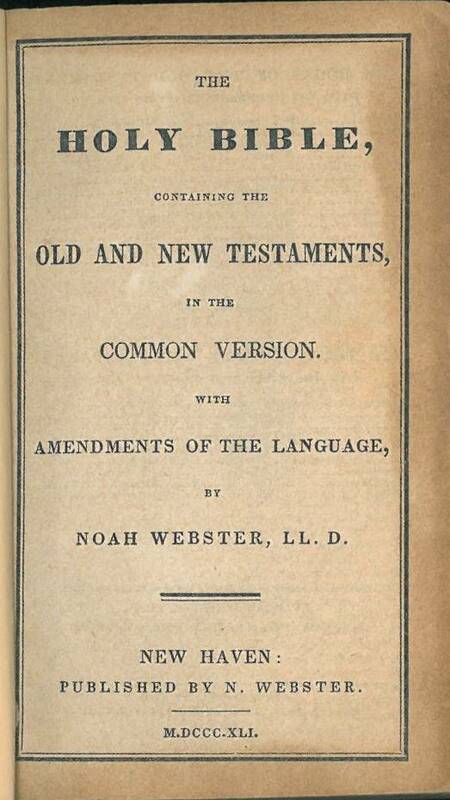 In 1833, Webster published his own version of the Bible which was a revision of the Authorized Version; he corrected grammar, replaced words that were no longer used, and did away with words and phrases that could be seen as offensive. The Bible was not well received in part because it went too far for those who preferred the Authorized Version and not far enough for those who saw a need for a more through revision. 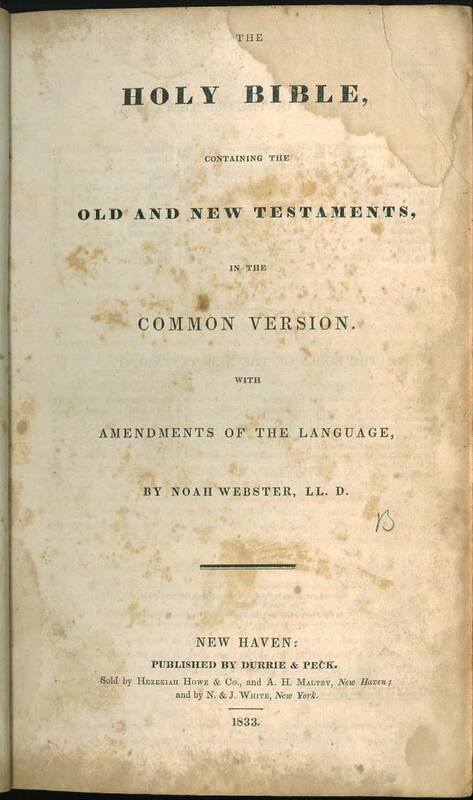 In addition to the 1833 edition, a separate New Testament was published in 1839, and a second edition of the complete Bible was published in 1841. A facsimile of the 1833 edition was published by Baker Book House in 1987. Title: The | Holy Bible, | containing the | Old and New Testaments, | in the | Common Version. 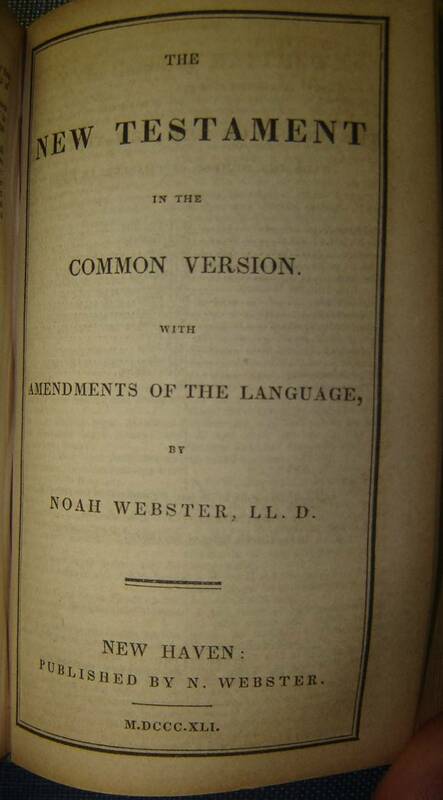 | with | Amendments of the Language, | by Noah Webster, LL. D. | New Haven: | Published by Durrie and Peck. | Sold by Hezekiah Howe and Co., and A. H. Maltby, New Haven; | and by N. & J. White, New York. | 1833. Description: 8vo A-B81-11381144 (p. xvi, 907,[b]) Text in two columns with center references and chapter summaries. 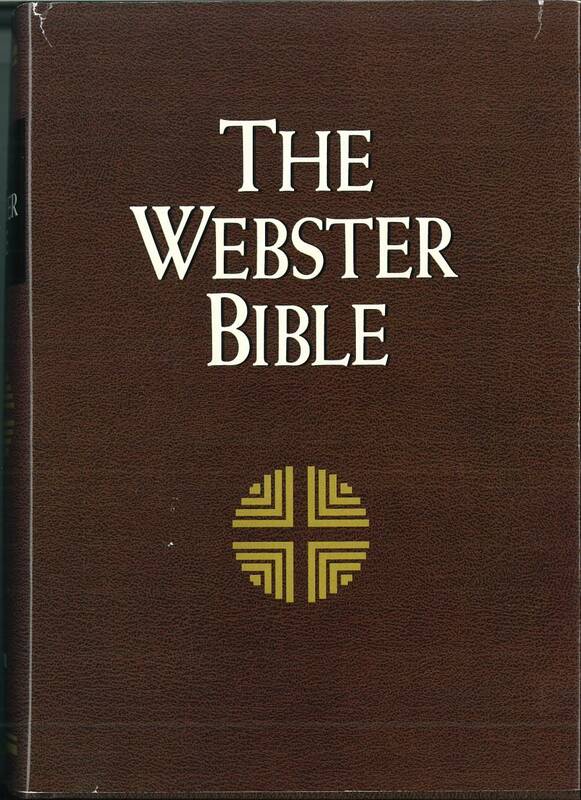 Location: Originals of Webster's Bible can be found at several major libraries and museums including the Yale University Library. References: Chamberlin p. 21-2; Darlow & Moule 1133; Herbert 1793; Hills 826; O'Callaghan 1833-8, p. 222; Taliaferro-BVE CN00010, Taliaferro-EELBV 7320. 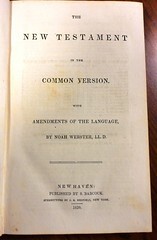 Facsimile: A pdf facsimile of the 1833 edition is available at books.google.com. 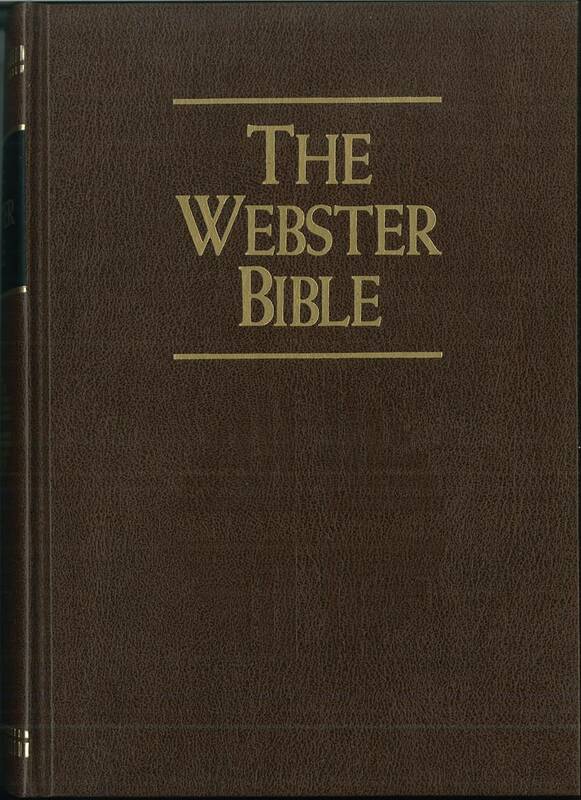 Comments: There are many articles on the Internet concerning Webster and the Bible he produced. One of these can be found at Bible Research site. Originals of the 1833 edition appear for sale from time to time on eBay - a complete copy sold for $3,100 in 2004 and a defective copy (missing the general title and a few other pages) sold for $2,800 in 2005. Another complete copy sold for $4,700 in February, 2008 (eBay item 140201787202). Title: The | New Testament | in the | Common Version. 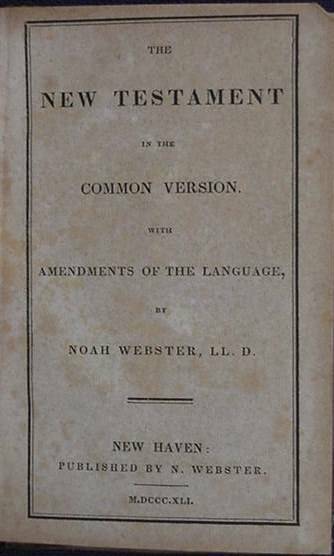 | With | Amendments of the Language, |by Noah Webster, LL.D. | New Haven: | Published by S. Babcock. | Stereotyped by J. S. Redfield, New York. 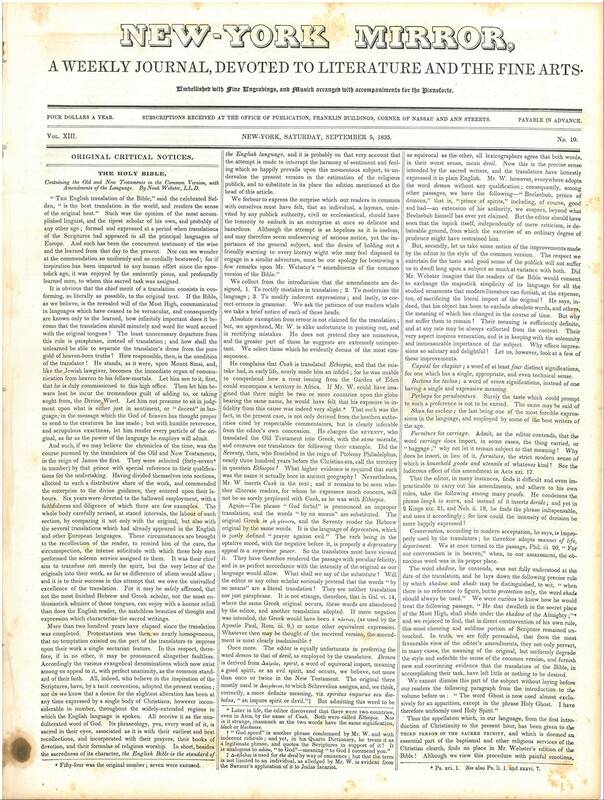 | 1839. Description: 12mo A41-2212234 (p. ,1-267,). 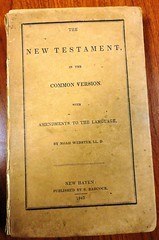 Includes Specimens of Emendations of Language in this Edition of the New Testament and a Corrections slip. Text in two columns with chapter summaries. Omits the center column references and notes. References: Hills 1061; O'Callaghan 1839-6, p. 264; Taliaferro-BVE CN00010, Taliaferro-EELBV 7320. Comments: Unlike the complete Bible which begins with 14 pages of Preface and Introduction, the New Testament begins with 4 pages of Specimens of Emendations of Language In This Edition of the New Testament. 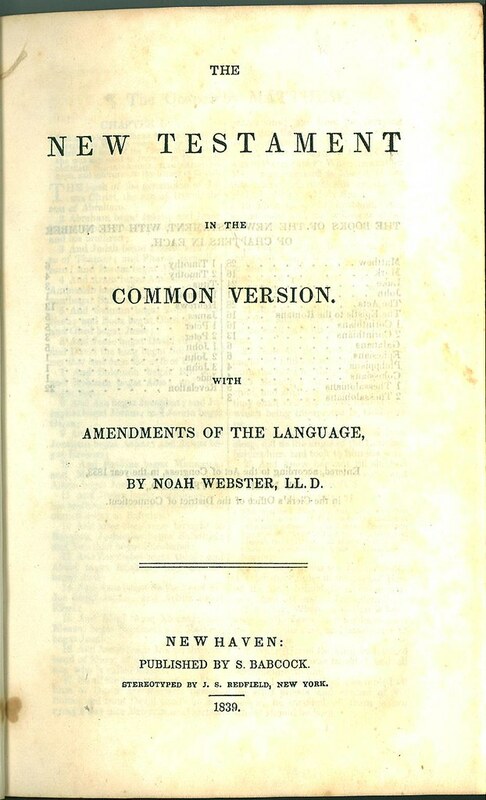 This is followed by the Title Page with the table of contents and copyright notice (Noah Webster, 1833) on the reverse. The text is arranged in two columns with each verse set an a separate paragraph. 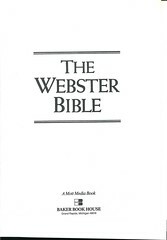 This edition does not contain the notes and references that appear in the center column of the complete Webster Bible. The last page of the text is numbered 267. 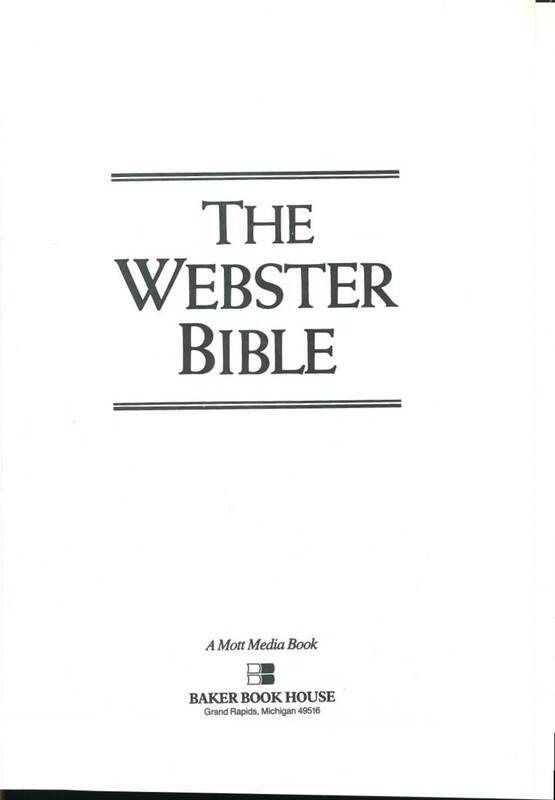 On the reverse of the last page are Testimonials by several pastors and professors on the value of Webster's Bible, including Jeremiah Day, President of Yale College. Location: A copy may be found at the Yale University Library. Facsimiles: A PDF facsimile of this edition is available at archive.org. 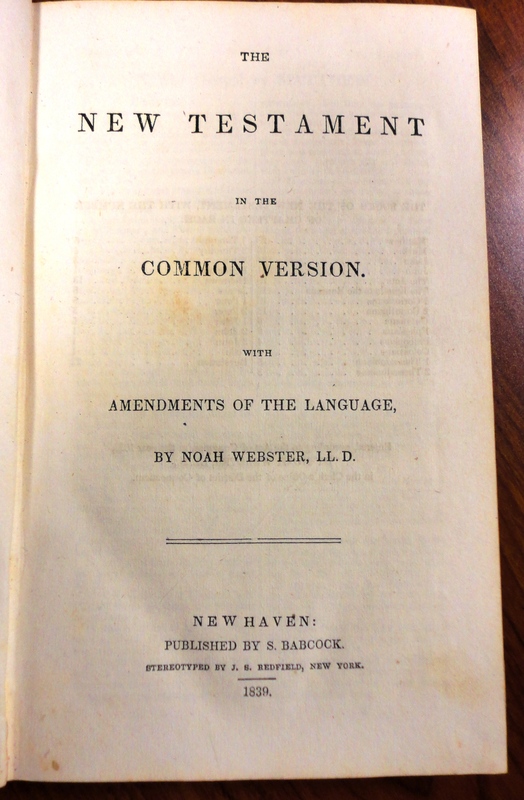 The O'Callaghan entry mentions an 1840 edition of Webster's New Testament in the Lenox collection. It is very likely this is the edition he was referring to as it has the date "1840" on the cover. 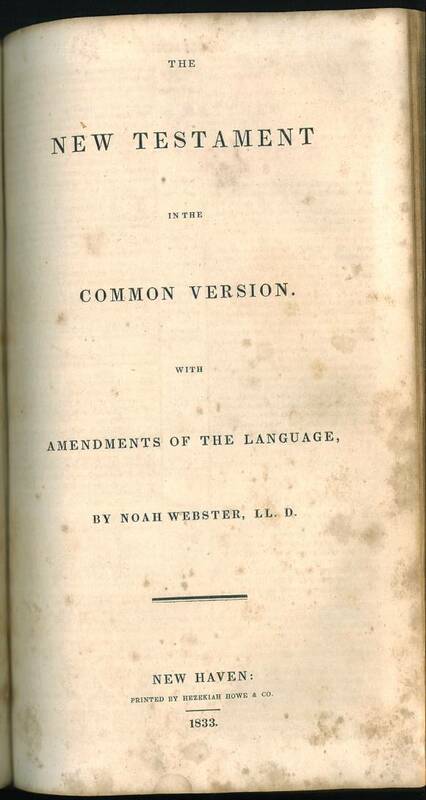 However, the text is the 1839 edition (as seen by the date on the title page). Description: 12mo A41-2212234 (p. ,1-267,). 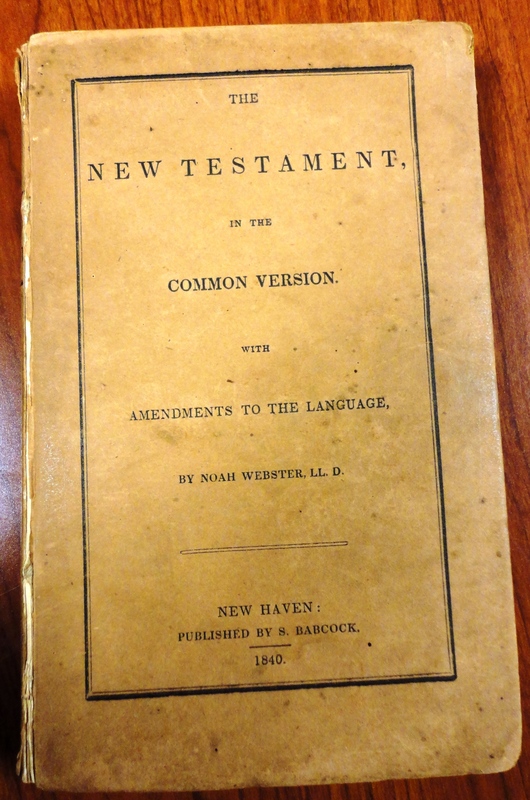 Includes Specimens of Emendations of Language in this Edition of the New Testament. Text in two columns with chapter summaries. Omits the center column references and notes. References: Hills 1061; O'Callaghan 1840-6, p. 268; Taliaferro-BVE CN00010, Taliaferro-EELBV 7320. Location: A copy is part of the collection of the Dunham Bible Museum located on the campus of the Houston Baptist University in Houston, Texas. Description: 16mo OT: 1-5316, 544 (p. 1-852), NT: 1-1616, 174 (p. 1-260) Text in two columns without center column or chapter summaries. References: Hills 1112; O'callaghan 1841-10, p. 269; Taliaferro-BVE CN00010, Taliaferro-EELBV 7320. Images: Title page, New Testament Title page. Comments: This includes the "Preface to the Octavo Edition" and "Introduction;" both reprinted from the 1833 edition. 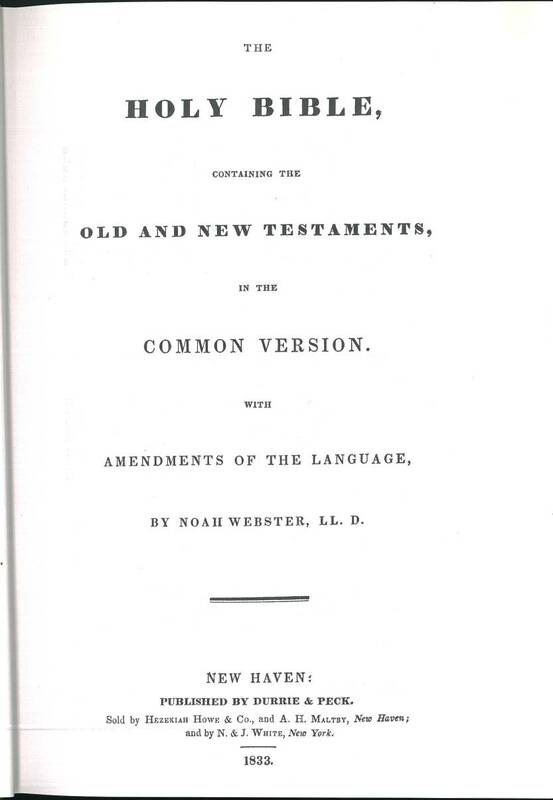 The New Testament has a separate Title page that is identical to the 1841 New Testament (infra.). References: Hills 1112 mentions that the New Testament was published separately, Taliaferro-EELBV 7320. Comments: This is the New Testament from the 1841 Bible (supra). Location: A copy may be found at the American Antiquarian Society in Worcester, MA. References: Chamberlin p. 21-2; Herbert 1793; Hills 826; Taliaferro-BVE CN00010, Taliaferro-EELBV 7320. Comments: This is a facsimile of the original 1833 edition originally published by Durrie and Peck. 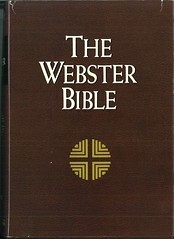 The facsimile is approximately 10% larger in size and does not contain the New Testament title page which is required by the signatures. Webster's revision was not well received from the beginning. Here is a review from the New York Mirror A Weekly Journal Devoted to Literature and the Fine Arts Vol. XIII, No. 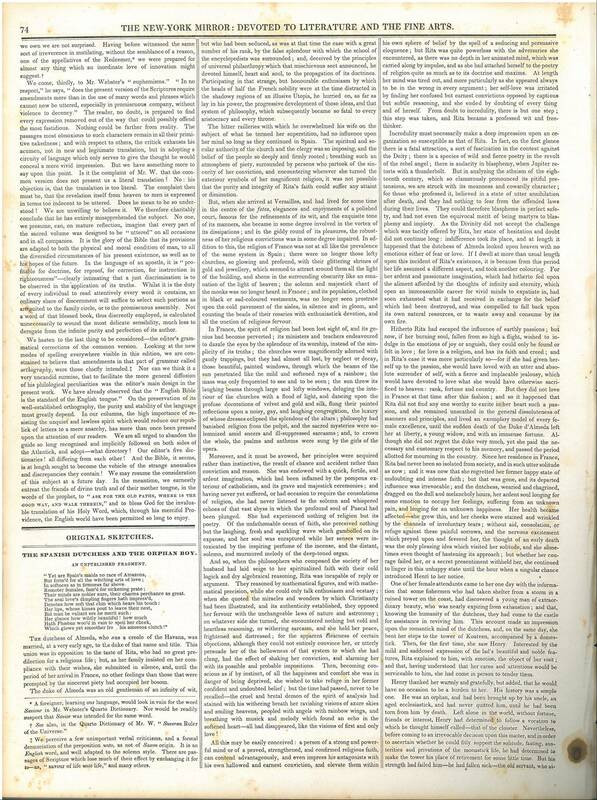 10, September 5, 1835. page 1, page 2.